An adult’s body is approximately 50 to 65% water. The percentage varies according to the percentage of muscle a person has versus the amount of body fat. This is because muscle contains significantly more water than fat does. In comparison, an infant’s body is approximately 75% water. The body uses all this water in a number ways. It helps regulate body temperature through respiration and perspiration. During rest, normal breathing can result in the loss of 400 ml or 13.5 oz. of water per day. Normal fluid loss through the skin results in about the same: 13.5 oz per day. On the other hand, intense physical labor or exercise can cause the body to excrete between 24 to 48 ounces of fluid per hour. Replacing those losses throughout the day caused by breathing and perspiring is necessary for regulating proper body temperature. The rule of thumb is to drink at least one ounce of water for every two pounds of body weight, depending on the level physical activity. In addition, a 5% drop in a body’s fluid levels through dehydration can result in as much as a 30% drop in energy levels. 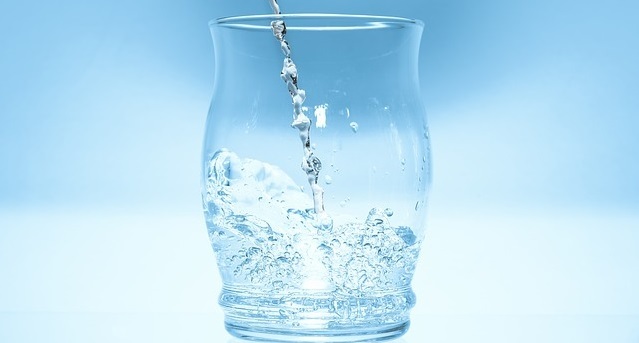 If you feel tired, having a glass of water can help restore you. However, a caffeinated beverage will encourage fluid losses because caffeine is a diuretic. So for every caffeinated beverage consumed, two glasses of water will be needed to replace the fluid that is excreted rather than absorbed. Water helps lubricate the internal organs, the muscles, and all the tissues surrounding the joints. The brain is composed of about 75% water, which helps cushion it inside the skull. The purity of the fluid also affects the efficiency of the neurological system, in general. Nutrients can be distributed around in the body through the fluids to nourish tissues and other systems, but toxins are also circulating through the fluids as well. The body uses water to detoxify itself by flushing out the toxins through the action of the kidneys and intestines. In order to do this the most efficiently, it is important to drink the cleanest water available. Most municipal water is loaded with chorine, bacteria, prescription medication residues, pesticides, phthalates (from plastics and detergents, among other things), solvents such as chloroform, and heavy metals such as lead and arsenic. All these substances keep our cells from nourishing and healing the body and from doing the work they need to do (like producing energy). Eventually, contaminants can build up inside the cells and create chronic symptoms. I recommend using a water filtration system at home, rather than buying water that is bottled in plastic, which pollutes the water with chemicals. A water filtration system can be anything from an elaborate and expensive permanently installed device, such as a reverse osmosis water filter, to a simple and inexpensive carafe style water filter. Under sink and counter top systems can filter a lot of water for a sustained period of time, whereas smaller units will need to be refilled frequently. If you are in the market for a new refrigerator, consider buying a model with a built-in water filter to purify both your drinking water and your ice (a reverse osmosis filter will also do this). All water filter systems will require a certain amount of maintenance that will include changing the filter(s) periodically and that cost should also be considered when making your purchase. Drinking adequate amounts of clean water on a daily basis makes it easier for the cells in your body to function optimally. And this makes it easier for your body to heal itself and stay fit and well. Over the course of your lifetime, investing in clean water will be worth the extra cost.